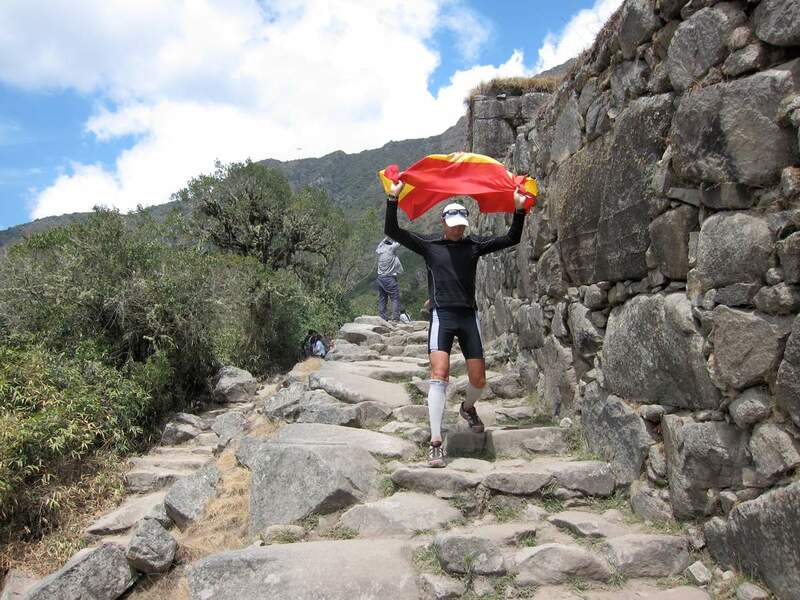 Apolo Esperanza Garcia waves the flag of his homeland, Spain, as he nears the finish to win the Machu Picchu Marathon in Peru. Garcia finished the trail marathon at high altitude in less than six hours on a route that typically takes hikers three days. Last month, 26 international runners completed the Inca Trail to Machu Picchu Marathon, a unique running adventure in one of the most historically significant and archaeologically mystifying places in South America. The nine-day trip, in its 17th year, is organized by Andes Adventures, a company started by ultra runner Devy Reinstein in 1996. It is a top-notch tour packed with adventure, history and culture gradually acclimating runners for marathon day and their first glimpse of famous Machu Picchu. Our trip began in Cusco, which sits at 11,200 feet and boasts many ruins within the city and its environs. Some of us arrived early and were offered a tour of the pre-Incan city of Pikillacta and our first of many steep climbs on a segment of the Inca trail leading to the ruins of Tipon, a water-engineering masterpiece of the Inca Empire. The next day, the rest of the runners arrived, and after introductions and a welcome lunch, we toured Cuscos many historic sites, including the cathedral, Qorikancha, the most important temple of the Inca Empire, and the Santo Domingo Monastery. After visiting Sacsayhuaman, an Incan fortress above Cusco at 12,136 feet, we embarked on our first acclimatization run, which took us through the village of Yuncaypata, the Temple of the Moon and San Blas before finishing at the Plaza de Armas in downtown Cusco. The next day, we began making our way to the marathon start with a drive along the Urubamba River into the Sacred Valley of the Incas. We visited the ancient Inca town of Chinchero, where we were given a traditional weaving demonstration by the locals and a visit to the ruins above town. Our second acclimatization run took place along a trail leading to the Urubamba River and passing through the Salt Mines of Maras. We toured more ancient sites the next day, then trekked six miles to the runners camp in the archaeological site of Llactapata within Machu Picchu Sanctuary National Park the day before the race. The race began at 6 a.m. with a steady rolling four miles along the Cusichaca River leaving the Urubamba Valley and approaching the village of Wayllabamba, the last inhabited village on the Inca Trail. The trail then began a steep climb, rising from 9,100 feet to the highest point at Warmiwanusqa Pass  Pass of the Dead Woman  at 13,779 feet. A steep, rocky descent followed, then another climb to Runkurakay Pass at 13,100 feet. With the steepest ascents behind us, we descended rocky slopes and passed through an Inca tunnel of carved steps, then headed down a stone staircase leading to Phuyupatamarca  Town in the Clouds  dropping into the cloud forest. As this lush forest of exotic plants and orchids surrounded us, the temperature rose noticeably. After three or four miles of dirt trail, we arrived at Intipunku  Gateway of the Sun  where we were treated to our first glimpse of Machu Picchu and the approaching finish. Covering the distance from Llactapata to Machu Picchu in one day is a significant accomplishment as most people typically take three days to hike it. Sharing this experience with other runners was unique and inspiring. The fastest marathon finisher with a time of 5 hours, 55 minutes was Apolo Esperanza Garcia from Valencia, Spain. Garcia currently is involved with a geo-running project, running marathons in all the important environments in the world. Machu Picchu was his final marathon, the rain forest, of the eight. It has been a great experience, giving me the opportunity to know both spectacular places and wonderful people from all over the world, he said. Garcia will return to Spain and begin writing his next book, Eight Skills to Face, Eight Challenges, a self-help guide for people to make their dreams come true. Laura Larkin of New Zealand was the first female finisher in a time of 7:02. This was Larkins first marathon-distance event. She loved the solitude and the vistas. Judy Adams of Montreal lauded the trip as being well organized with many cultural experiences and runs that showcased the back trails through the countryside. The day after the marathon, we toured Machu Picchu. The next day, we returned to Cusco by train and bus. Our final treat was a tour of Limas city center and a stay in the beautiful Miraflores area. This was a one-of-a-kind experience that will be relived through our memories and pictures for a lifetime and one that will be hard to top.